Hey, hey! Happy Wednesday! I've made it through half a week (almost) of work since the holiday break. It's all downhill from here! Thankfully I love my job and I love my coworkers, so it hasn't been terrible! Hope your week is going well also! 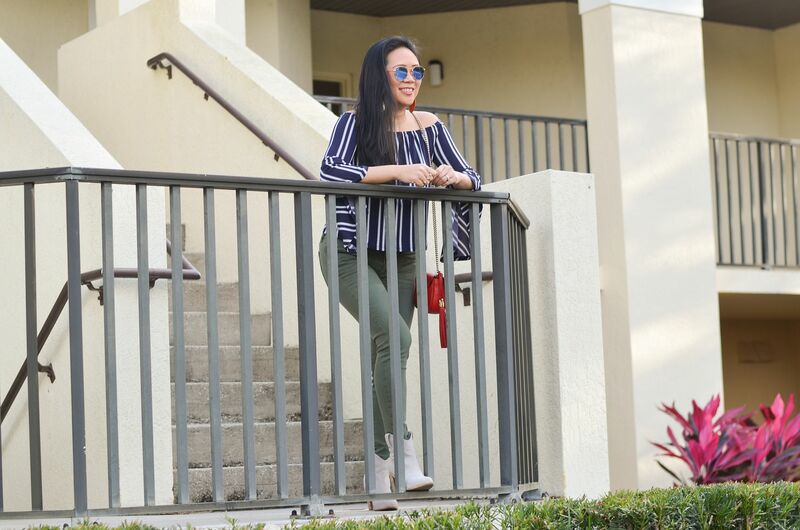 Today I'm sharing another outfit I wore while we were in Florida last week. 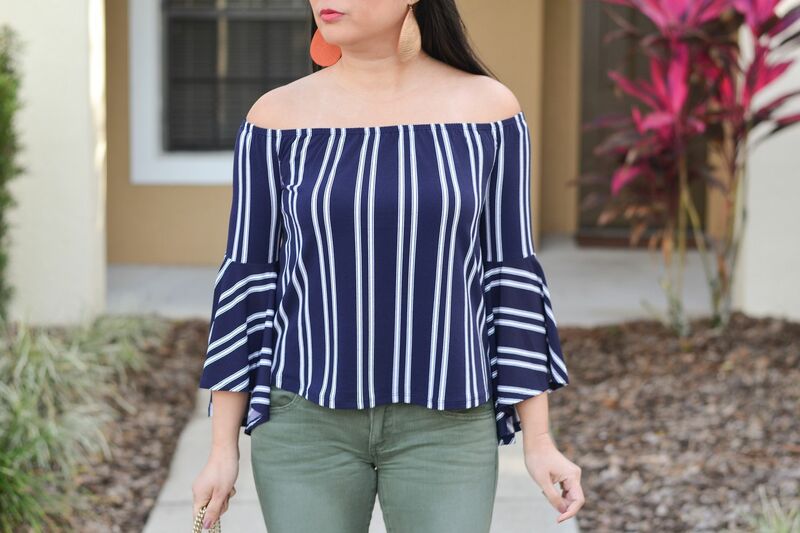 When I saw this top in store, I immediately grabbed it because it just looked perfect for our Florida trip. Obviously I loved the off the shoulders. I loved the dramatic sleeves too, even more so because they're not quite full length sleeves, which means no complications while going to the bathroom... The elastic on the neckline is great and 100% stays put and does not ride up on my shoulders at all. And the length is perfect for my short torso. I loved that it is relaxed through the torso but not super long or oversized like everything seems to be nowadays. I'll take the volume in my sleeves, but please don't add girth to my mid-section! Ironically, I got this thinking it would be perfect for Florida, but I wished I had packed sweaters instead. I was chilled to the bone the entire trip. I was hoping to lay out and get some sun even if the pool was too cold, but that did not happen! Instead, my face was windblown and I was missing my thigh-high sweater socks and Uggs! I never knew Florida could get that cold. Sadly, they were experiencing record low temps and of course the day after we left, boom! Back in the 70s. Ugh. Granted, it was in the negatives here in St. Louis while we were gone, so I really can't complain. Apparently, we had over 13 consecutive days of weather below 32 degrees and that's only happened 3 times in the history of St. Louis, the last time being in the late 1800's! So, I guess I should shut up about freezing in the 30s and 40s in Florida! On vacation! Oh yea this year we had some serious cold fronts last week was even worse. Love this pretty look, very Florida indeed. That outfit is so cute!! I love it.